Most recordings which include the flageolet are of modern, popular works. Very little interest has been expressed in the recording and preserving of the old popular music written for the flageolet and little more in recording the older art music written for the instrument. Two CDs which have attempted to preserve traditional Flageolet music are Early American Roots and Unicorn by the American Ensemble Hesperus. On both CDs, the Flageolet is played by Scott Reiss. Whilst Unicorn is a “cross-over” album, containing pieces from many different genres, Early American Roots, which aims to recreate some of the music played in the earliest days of the American Republic, is probably the best recording of traditional flageolet playing. Perhaps the most interesting current flageolet-player is Mats Gustafsson, a Swedish jazz Saxophonist who also plays the fluetophone—a “cross between a flute and a saxophone”. However, he also uses the French Flageolet frequently on his recordings, often exploiting the highest reaches of the instrument. Important recordings using the flageolet include Frogging (1997) and The Education of Lars Jerry (1999). One of his main compositions, Viska Mix IV (1994), also uses the flageolet, being scored for Tenor Sax, Fluetophone and French Flageolet. 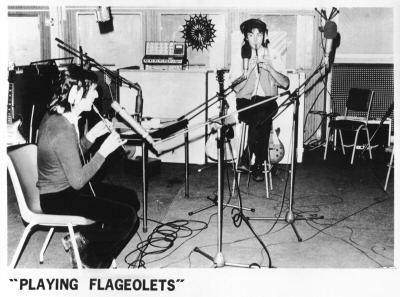 Fiona's Folly by American folk duo Mickie & Elizabeth contains a track, “As I Roved Out” played on the Double Flageolet and (I believe) the Concertina. They, very generously, have a copy of the track available on their website which can be downloaded for free personal use. The most famous CD which includes the Flageolet is Mike Oldfield's Tubular Bells. It was recorded in 1972 and released in 1973 as the first album on the Virgin label. It quickly became extremely famous because of its use on the sound-track to the Exorcist. Vivian Stanshall acts as a “Master of Ceremonies” for the piece and reads off all list of instruments included in the work. These include: Acoustic guitar, bass guitar, electric guitar, Farfisa, Hammond, Lowrey organs, fuzz guitars, glockenspiel, “honky tonk” piano, mandolin, piano, percussion, Spanish guitar, speed guitar, taped motor drive amplifier organ chord, timpani, violin, vocals, tubular bells and the flageolet. Also, I have had little success trying to find out what has happened to Christopher Taylor since the recording to ask him, himself, what instrument was used.